Welcome to this year's 38th issue of DistroWatch Weekly! It's a Mandriva week, no doubt. With the imminent release of its brand new version 2007, all eyes of the Linux community are now on the French distribution maker whose new product is likely to raise the usability and eye candy bar for desktop Linux distributions significantly. Can Mandriva regain its former glory? We'll find out soon. In other news: the development of the venerable RPM Package Manager is in deep trouble, Terra Soft announces Yellow Dog Linux 5.0, NetBSD continues its round of negative publicity, and a trial edition of Xandros Desktop 4 is now available for free download. In our "Tips and tricks" section we'll let you on some secrets about extracting package lists from various distributions, while the "Statistics" feature looks at the DistroWatch visitor numbers from the Middle East. A couple of site updates follow before the usual database summary concludes this issue. As always, happy reading! It's the busiest time of the year for Mandriva as the Paris-based company prepares for the launch of its brand new Mandriva Linux 2007. A press release announcing the second and final release candidate went out late on Sunday, indicating that the company's developers and public relations personnel gave up on the weekend, focusing instead on delivering the best Mandriva experience ever. This is good news. Based on the first impressions of many beta testers, Mandriva Linux 2007 is going to an impressive release, especially once all the new 3D effects are configured and turned on. When will the new product be out? If the release process of the previous Mandriva Linux is anything to go by, the product will at first be made available to early seeders, then after a couple of days it will be formally released to the members of Mandriva Club. About a week or two later the complete installation tree should start appearing on Mandriva mirrors, making it possible for everybody to perform an FTP/HTTP installation. Then, in about 2 - 3 months, the complete CD and DVD images of the product's "Free" edition will also be released for public download. If you don't want to wait that long and are not interested in joining the Club, then the second release candidate is about as close to the final release as it gets. Of course, the above timeline is just a guess, since Mandriva prefers to keep things secret. We really hope that the new release is a great success and that Mandriva Linux 2007 becomes an interesting alternative to the current desktop distro leaders - Ubuntu, openSUSE and Fedora. As a distribution that once was the undisputed king of desktop Linux, we know that Mandriva has the talent and resources to deliver fantastic products to its users. As soon as Mandriva Linux 2007 is out, give it a try - even if you've already settled on another distribution, chances are that you'll be quite impressed with the latest from Paris. The RPM Package Manager (RPM), originally developed by Red Hat, but later also accepted by openSUSE, Mandriva, Turbolinux, Yellow Dog Linux, Ark Linux and dozens of other distributions, remains one of the most popular package management systems on Linux. But is it still being developed? LWN.net's Jonathan Corbet investigated the status of the venerable utility and summarised his findings in an entertaining and well-written article entitled Who maintains RPM? Apparently, the RPM Package Manager is currently being developed by one Jeff Johnson, a former Red Hat employee, who has turned out to be a rather difficult fellow to deal with - as witnessed in the many bug reports and related discussions linked from the above article. As a result, most major distributions have decided to stay with an older version of RPM instead of upgrading to the most recent one (version 4.4.6); the current stable and development releases of both Fedora Core and openSUSE ship RPM 4.4.2, while Mandriva Linux is the only major distribution that has updated its RPM utility to version 4.4.6. Is the development of RPM Package Manager in danger? Or is an uncooperative developer a good enough reason to fork a project? Please discuss below. Speaking about Yellow Dog Linux, those readers who still enjoy using the only dedicated distribution for the PowerPC processors, will be excited to learn that a new version of the product is now under heavy development. In a mailing list post entitled A letter from Terra Soft's CEO, "One year later...", Kai Staats discusses the impact of Apple's switch to Intel on Terra Soft and Yellow Dog Linux. The good news comes in the following paragraph: "As promised, Yellow Dog Linux is refocused on the desktop with a pending fall release of the consumer v5.0 product. Built upon the Fedora Core 5 base, YDL v5.0 will be made available through YDL.net accounts and the public mirrors with less emphasis on a shipping, box product. While we can't let the dog out of the bag just yet, we can state that YDL has never looked so good." So don't throw your PowerPC-based Macs out of the window just yet - there is still plenty of life in them! The Ubuntu Marketing Team has launched a survey with the objective to find out more about the distribution's potential, current and previous customers and users. The idea is to evaluate their responses and determine what needs to be done to attract new customers and users, to retain existing ones, and to re-capture previous customers and users who had once used Ubuntu, but later switched to a different operating system. The four survey question sets are devised for different groups, depending on their present and past relationship with Ubuntu. To find out more, please see the Ubuntu Surveys page on the project's Wiki. The survey is conducted by GeekoSophical.net and interested readers can now fill it in online. No personally identifiable information is collected in the survey. Xandros Corporation has announced that it started offering a free 30-day trial edition of Xandros Desktop 4 Premium for free download: "Xandros is now offering free 30-day evaluations of the all new Xandros Desktop Home Edition - Premium. Now you can discover for yourself the benefits and features of the new Xandros Desktop." To get the download link, please visit this page and click on the "Free 30-day Trial" link in the right column. After registering your name and email address you will receive a download link by email. Xandros Desktop 4 is an excellent beginner-friendly distribution with a customised version of KDE and a host of intuitive desktop utilities designed to ease migration from Windows to Linux. Originally released in June 2006, the product's latest version is based on kernel 2.6.15 and includes X.Org 6.9.0, KDE 3.4.2, OpenOffice.org 2.0.1, Firefox 1.5.0.4, and other popular open source applications. It is often said that the two most popular open source desktops -- GNOME and KDE -- are rather heavy on resources and require reasonably modern hardware. But has anyone ever done a comprehensive comparison? Lubos Lunak, a KDE and openSUSE developer, has decided to find out for himself by designing a series of benchmarks on KDE, GNOME, XFce and WindowMaker, with various (native and non-native) applications open for input, to compare memory usage in a variety of situations. The results are quite interesting. As an example, running AbiWord (a GNOME application) on KDE is considerably less memory intensive than running the same word processor on GNOME. While KDE certainly is more memory hungry than either XFce or WindowMaker, it seems to have a significant advantage over GNOME. Nevertheless, the report might have been somewhat biased by author's own preference, but even so - it's worth a read, especially if your computer is already a few years old or low on RAM. Many readers interested in the future of NetBSD have been alarmed by recent bad publicity and accusations brought up by one of the project's founders - Charles Hannum. After being promptly relieved of the task of working on the popular multi-arch operating system, the former NetBSD Technical Lead has talked to BSD DevCenter about the beginnings of the project, the subsequent OpenBSD fork, current issues with driver development, XFree86 vs X.Org concerns, and a number of other interesting topics. Asked to compare the developments of NetBSD and Linux, Hannum continues to attack his former project: "I think the first thing to do is have a firm set of commit standards. ... The Linux kernel effectively has such standards now because everything is filtered through a small set of people with reasonable taste. That's not to say I agree with all of their choices, but they seem to do a good job of enforcing their standards and principles, and I have to respect that. NetBSD today does a very poor job of setting and meeting standards." The very interesting, 3-page interview starts here. One of the age-old annoyances affecting FreeBSD -- at least from the desktop user's point of view -- is the effort required to keep the installed applications current. A useful, hands-free method to achieve just that is by combining the power of "portupgrade" with a few bash scripts to automate the process. Although upgrading ports in this way is not without its dangers (you should always read the /usr/ports/UPDATING file before launching any ports upgrading utility), it can be a good way of keeping a non-critical FreeBSD system up-to-date. This article, called Strategy For Updating Ports, explains the details and provides instructions for setting up the update mechanism, complete with a couple of bash scripts to automate the process. Read it and decide for yourself whether you want to use it, or whether you prefer to baby-sit the upgrade process of each and every port. IPCop is without a doubt one of the best free firewall distributions available today. Created in 2001 by several ex-SmoothWall developers, the project has been around for long enough to achieve a reasonable market penetration among the more security-conscious Linux users wishing to deploy an extra layer to protect their networks. But what are the future plans for the popular firewall project? Italy's OSS Blog has published an interview with Gilles Espinasse, the IPCop release manager: "Q: The 1.5 release will bring some important new features. Could you give our readers some information of what users can expect? A: Mainly 2.6 kernel (that means drivers that are only on 2.6), multiples interfaces in the same category (red/green/blue/orange), new installer. We will also include some of the most important add-ons, such as OpenVPN, block out traffic, advanced proxy and URL filtering." Read the rest of the interview here. How popular is Linux in the world's most populous country? With the ongoing crackdown on media freedom and other restrictions on news reporting, it is encouraging to see that many technology enthusiasts in China are increasingly joining online communities that develop Linux distributions and other open source software. Recently we reported about Dubuntu, a simplified Chinese edition of Ubuntu, while earlier this week we learnt about another new community distribution - Everest Linux (see the new distributions on waiting list section below for further details). Given the increasing number of Chinese visitors reading DistroWatch, we thought it would be interesting to find out which distribution-specific pages our Chinese readers visit the most often. As can be seen in the table below, the list is rather similar to what readers from most other countries view. Somewhat unexpectedly, China's own domestic distributions scored poorly in this statistic, with Red Flag Linux barely making the top 50, while Asianux is only just inside the top 100 most visited pages. The right-most column in the table represents the number of visits from unique Chinese IP during the 6-month period between 1 March 2006 and 31 August 2006. Here at DistroWatch we spend a fair amount of time getting package lists out of distributions and presenting a partial list in a visually structured manner on the relevant pages. But what if you are interested in a particular package that is not listed in the DistroWatch tables? In that case you need to extract the package list yourself and look up the version of the package you are interested in. Here is how we do it in most distributions. Gentoo provides a number of alternative methods for obtaining the list of installed software, including "epm", which is a clone of the "rpm" command and takes many of the same switches, but these tools are rarely installed by default. The above-mentioned command is about the most reliable method of finding out which packages are installed on a Gentoo Linux system. In case of an Arch installation CD, all packages are conveniently placed in the arch/pkg/ directory and can be viewed with a simple "ls" command. The BSD family of operating systems uses a "ports" system to compile and install software directly from source code. As an example, on a recent FreeBSD installation CD, all available packages are stored in the packages/ directory. Once FreeBSD is installed on a hard disk, information about all installed ports is stored in the /var/db/pkg/ directory. All you need to do is to list the content of the directory with "ls". The above information covers a good 95% of distributions available today. There are exceptions - rPath Linux has come up with an independent package management solution (now also adopted by Foresight Linux) and so have some regional distributions, such as Pardus Linux or UHU-Linux. Nevertheless, these are comparatively rare and the vast majority of new distributions still prefer to use one of the well-established package management utilities. Usually, downloading just a couple of megabytes of an ISO image is sufficient for the above command to work. Once the CD or DVD image is mounted, you can simply navigate to the /mnt/loopback/ directory and take a look around. While you won't be able to view the content of individual files, you'll be able to browse the directory listing of the partially downloaded ISO image. How much interest is there in Linux and open source software in the Middle East? If our visitor figures are anything to go by, this is a region where popularity of open source operating systems seems to be growing at a rapid pace. During the time between 1 January and 31 August this year, the main index page of DistroWatch.com received a total of 241,728 visitors from the region. Also, judging by emails we receive from developers and users residing in the Middle East, as well as by the number of distributions developed in the area, it's safe to say that there are fairly large Linux communities in Israel, Turkey, Egypt and Iran. Further adding to our perceived popularity of open source software in the region was the fact that when we issued a call for volunteers to help us with translating the site's menus and frequent phrases into Hebrew, Arabic and Persian, we were quickly flooded with offers of help. But let's not speculate much and take a look at some real figures instead. As expected, Israel has supplied the majority of visitors to DistroWatch, both in absolute terms and in "per capita" terms. Turkey came at number two in the total number of visitors, but the comparatively wealthy Gulf states of Bahrain, Qatar, United Arab Emirates and Kuwait were ranked higher once the population figures were taken into account. Not surprisingly, Iraq ended up at the bottom of the list, with an average number of only 19 visitors per months reading DistroWatch. But even this figure can be considered progress - just three years ago this site never received a single visitor from Iraq. Detailed numbers can be found in the table below. The index figure in the right-most column represents the number of visits per month per one million inhabitants. For reference, this number stands at 2,883 for the USA, 1,773 for Italy and 6,291 for Finland, the world's highest ranked country in terms of "per capita visits". Disclaimer: The origin of visitors is generated by using Maxmind's GeoLite Country database, which claims 97% accuracy of its data. As always, please don't take the data too seriously. They are simply provided as an indicator of interest in DistroWatch (and, by extension, in Linux and other open source operating systems) in various countries, but they certainly don't represent physical installations or distribution downloads. See also: Linux in the South Pacific, DistroWatch in Central America. A new version of trixbox, a CentOS-based distribution that enables the home user to quickly set up a VOIP Asterisk PBX, has been released: "It's time for another release of trixbox. We have fixed a lot of bugs. SugarCRM should work without any blank pages now. All the latest software is in this release, Asterisk 1.2.11 and CentOS 4.4, etc. We also have some cool new features. The goal of trixbox is to be the easiest Asterisk install. We now have a service provider wizard that sets up service providers for you. The coolest new feature is the Endpoint Manager. This new endpoint auto-configure system will scan your network for SIP phones and add them to your trixbox!" Here is the full release announcement. Frugalware Linux 0.5 has been released: "The Frugalware Developer Team is pleased to announce the immediate availability of Frugalware 0.5, our fifth stable release. Here are the most important changes since 0.4: up-to-date packages: GNU C Library 2.4, GCC 4.1.1, KDE 3.5.4, X.Org 7.1, OpenOffice.org 2.0.3 (a native version for x86_64 users, too); security support: as of Frugalware 0.5, security support is provided until the release of the stable Frugalware 0.6; created a new tool called 'setup' to collect the available configuration tools; localized the package manager (French, German and Hungarian translations are available); installer improvements...." Read the rest of the release announcement for more details. Puppy Linux 2.10 is out. From the release notes: "A massive upgrade of most package versions - AbiWord 2.4.5, Gnumeric 1.6.3, SeaMonkey 1.0.4, GTK+ 2.8.17, X.Org 7.0...; most of the packages now compiled using the T2 build system; the 'devx' module is a simple method of converting Puppy into a complete C/C++ compile environment; SquashFS now has LZMA compression, allowing us to put more packages into this release, yet the live CD ISO file is smaller; the Smartlink and Lucent soft-modem drivers and support utilities are now in the 'standard' live CD; Sweep replaces mhWaveEdit sound recorder and editor...."
SabayonLinux 3.0 has been released: "The SabayonLinux Team is proud to announce SabayonLinux 3.0 x86 and x86-64 editions." Some of the new features found in this release include: "Out of the box Intel Mac support and Intel video cards Direct Rendering support; Quake4 Demo; added the possibility to configure boot settings using SabayonLinux Installer; X.Org 7.1.1; KDE-meta ebuilds using Kopete 0.12.1 (KDE 3.5.4); SabayonLinux 3 now uses gentoo-sources, currently version 2.6.17-r7; early Compiz initialization for KDE and XFce; GPT partitions support and A20 gate fixes for GRUB legacy; new GTK+ Cairo enabled theme and SLAB menu for our GNOME users; completed the SabayonLinux KDE theme (colours and ksplash)...." See the release announcement and changelog for further information. Henry Jensen has announced the release of DeLi Linux 0.7, an independently developed distribution designed to run on very old computer systems (those with a minimum of 8 MB of RAM): "I am proud to announce the release of DeLi (Desktop Light) Linux 0.7. DeLi Linux is a distribution made for old hardware. Machines from i386 to Pentium I with 8 to 32 MB RAM are considered as target systems. DeLi Linux uses lightweight software wherever it is possible. Nevertheless, it also provides a graphical desktop with an office package, web browser, e-mail client, PDF viewer and games. The most important changes: based on uClibc 0.9.28; kernel 2.4.33.3; a 'stripped-down' X.Org 7.1; a BSD-like ports system (borrowed from CRUX)." More information can be found in the release announcement and on the project's home page. StartCom Enterprise Linux AS-4.0.3 has been released: "With the fourth release of the Advanced Server 4 series, StartCom confirms its commitment for the continued and free distribution of the StartCom Linux operating systems and the updating and maintaining of their software packages - which results in a range of secure, stable server and multimedia platforms. The just released AS-4.0.3 ('Barak') features more than 300 updated packages in addition to other minor changes. One of them is the dropping of the popular Ethereal network sniffing tool, instead the forked version of Ethereal, called Wireshark was added." Here is the brief release announcement. Download: Barak-i386-u4-DVD.iso (2,048MB, MD5). Two quick site updates. The basic browsing interface of DistroWatch is now available in Ukrainian. If your browser's preferred language is set to the East Slavic language, the site will automatically load the localised interface, otherwise you can select it by clicking here. Many thanks to Olexandr Kravchuk who has done the translation. On a separate note, we have added a "snapshot" column to the T2 page. The new column tracks the project's development branch and is now updated automatically once per day. BHLD. 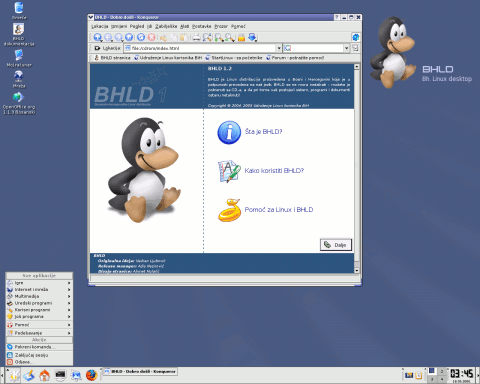 BHLD is a Bosnian live CD based on KNOPPIX. Its goal is to create a complete desktop Linux distribution fully localised into Bosnian. Everest Linux. Everest Linux is a Chinese community distribution based on Red Flag Linux. Linbox Rescue Server. Linbox Rescue Server (LRS) is a tool to centralise hard disk images (like Ghost Enterprise Server), file backups, hardware and software inventory (with Windows, Linux, and Mac OS X agents), and remote access on a single server. It can be managed from any PC through a web-based administration interface, and disk images can be restored using PXE boot or using a bootable CD or DVD. It supports Ext2/3, ReiserFS, XFS, JFS, and LVM v1/v2. The project also provides a bootable CD image which installs Debian "sarge" and a full set of LRS applications.